1. Install free software on your laptop. lalarm.com/LaptopAlarm. 2. Fasten a neck strap to the flash drive. 3. Fasten the other end of the strap to a table. 4. 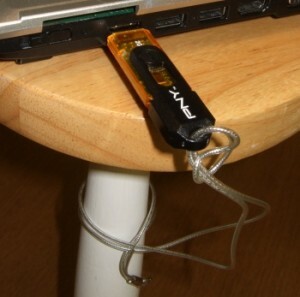 Plug the flash drive into the USB port of a laptop. 5. Lock the laptop by pressing the Windows logo key and “L” key together. When a thief removes the laptop from the table, the USB flash drive will be disconnected from the laptop and a loud siren will sound. In addition to sounding an alarm, the software sends an alert to your cell phone. Even if the thief gets away with the laptop, its data is destroyed by the software, so your identity can’t be stolen.